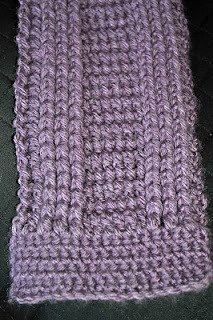 CS (cluster stitch) - (yarn over (YO), insert hook in next slip st, YO and pull up 1/2" loop) twice, YO and draw through all 5 loops on hook, ch 1. CS made. Important Note: For CS on all rows after the first row using CS, instead of inserting the hook in the next slip st, insert the hook from front to back and back out to front around the CS of the previous row. Treat these CS as if they are post stitches around the previous row's CS. 2. Sc in second ch from hook. Sc across. Turn. Do not ch 1. 3. Sl st across in each sc. Ch 1. Turn. 4. Sc in the two loops facing front (i.e. the loops of the sc sts) across. 5. Repeat steps 3 and 4 two more times. 6. Repeat step 3, but end with ch 2. 7. Going through the two loops facing front, dc 1 in first st, CS 1 in next st, skip next st, CS 1 in next st, skip next st, CS 1 in next st, dc 1 in next 6 sts, CS 1 in next st, skip next st, CS 1 in next st, skip next st, CS 1 in next st, skip next st, dc 1 in next two sts. Do not ch. Turn. Sl st across in the top of each st and around each ch st. Ch 2. Turn. 8. Repeat step 7 twice, but use 6 hdc sts instead of the 6 dc sts in the middle. Follow the pattern of using dc in one row followed by two rows using hdc. 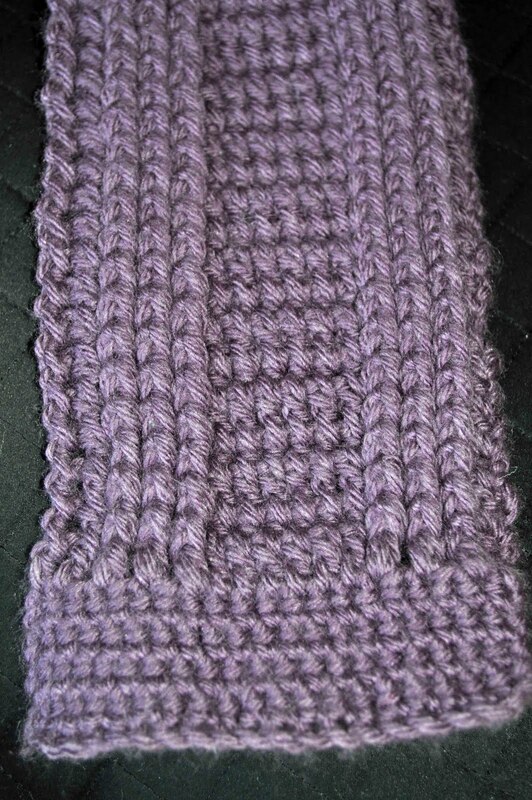 This prevents the middle section from bulging and keeps it more even with the rest of the row. 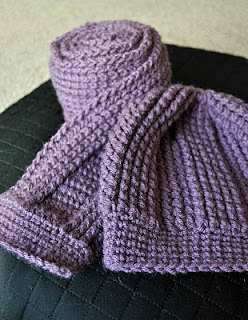 Continue until scarf is 1" from desired length. Ch 1 instead of 2 in last row. 9. Sc 20 st evenly across. Do not ch. Turn. If there are problems with this pattern, please comment and I will try to fix it. I like this scarf and am making it for the Special Olympics. Thanks for the pattern. 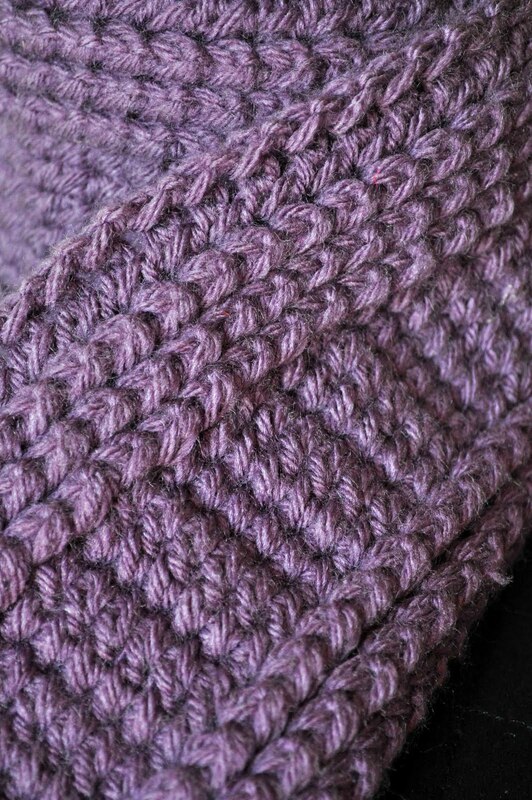 hi...looking for the cluster stitch hat pattern but it's no longer available at the link u posted last year...can you post a recent link? :) thnks! Leisure Arts recently redid their website and you now apparently have purchase the hat pattern. 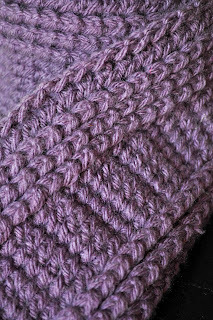 It can be found at: http://www.leisurearts.com/crochet/cluster-stitch-cloche-crochet-pattern.html . It is a bit of a shame that it is not free anymore. The above URL no longer works. The following one is current: http://www.leisurearts.com/products/cluster-stitch-cloche-crochet-pattern-digital-download.html . I'm a chemist who crochets a lot. Lately, I've been creating my own crochet patterns and since I mostly use free online patterns, I figured I would add mine to the lot.